CompleteGest® / 90 Veg Caps - Nature's Way®. Why use supplemental digestive enzymes? It is a potent, vegetarian source of digestive enzymes. Take 1 capsule with meals up to six times daily. If you are pregnant, nursing, or taking any medications, consult a healthcare professional before use. 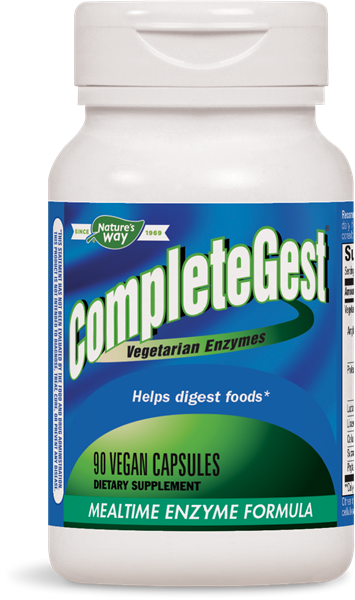 Is CompleteGest® a complete and comprehensive digestive enzyme? Yes. CompleteGest® provides a combination of plant enzymes to support complete digestion of all types of nutrients including protein, carbohydrates and fats. * CompleteGest® is ideal for individuals looking for a vegetarian alternative to a porcine-derived enzyme.